As a flower shop, we specialize in arranging flowers, not growing them. Many years ago, our great-grandfather and grandfather dappled in growing some of the flowers for the shop, but they didn't find it very successful, so now we leave that delicate task to our skilled farmers around the world who dedicate themselves to cultivating many different flowers in their appropriate climates. We are very grateful to have built lasting relationships with many of these famers. 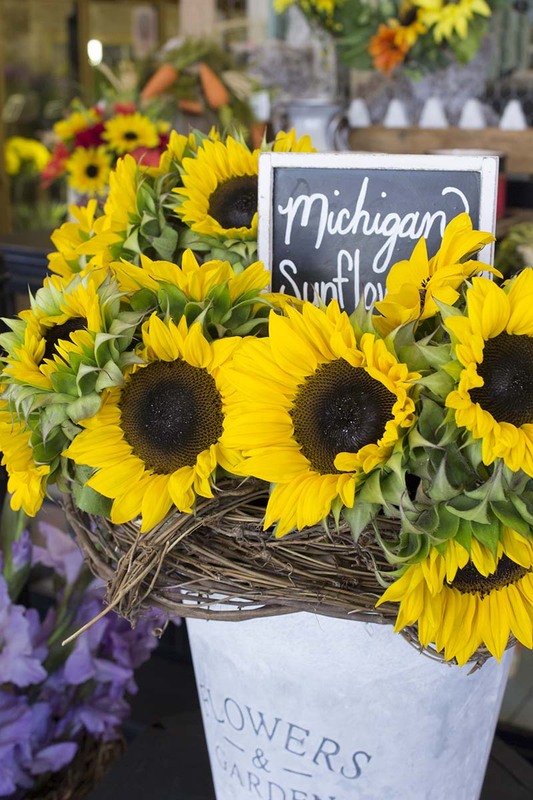 There is one time of year, however, that is extra special for us, and that time is when our local farms are bursting with beautiful Michigan flowers. We are proud to be a local family-owned business, so we eagerly jump at the opportunity to feature flowers from our home state and local community. The harvest season for mixed Michigan flowers is very short, but that only raises our excitement because of our long anticipation. It's like if you had the opportunity to eat your favorite dessert every day for the rest of your life, it wouldn't be as special anymore. Michigan flowers are our special treat that we get to enjoy one time a year - during the late summer and early fall. As born and raised Michiganders, we have a special fondness and pride associated with all things Michigan related. Our favorite place to vacation is up north near Glen Arbor. 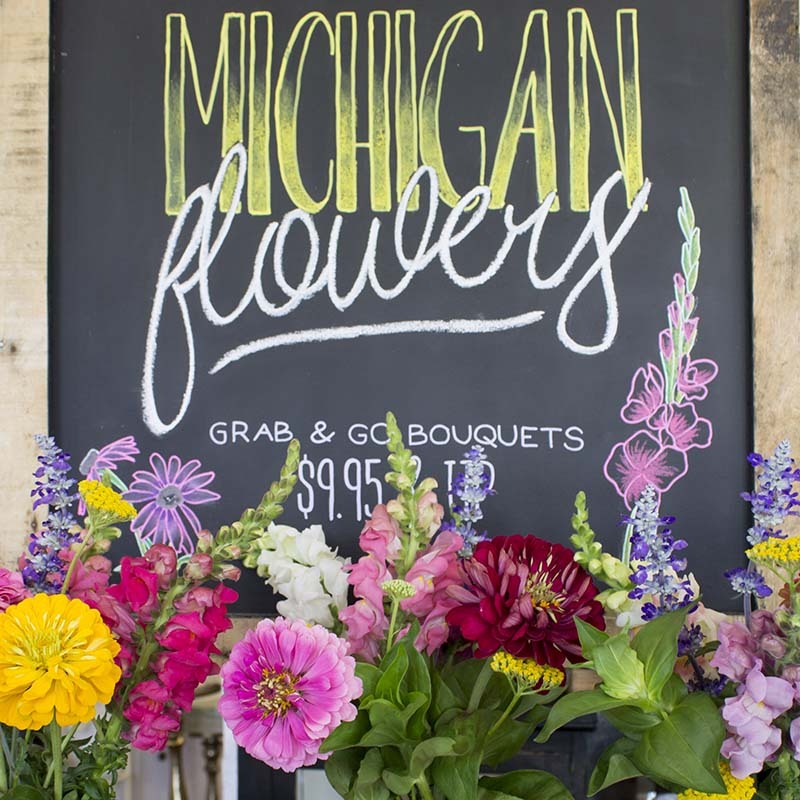 Michigan is picturesque with it’s lakes, sand dunes, unique rocks, and cities, but it is also home to some of the most beautiful seasonal blooms. 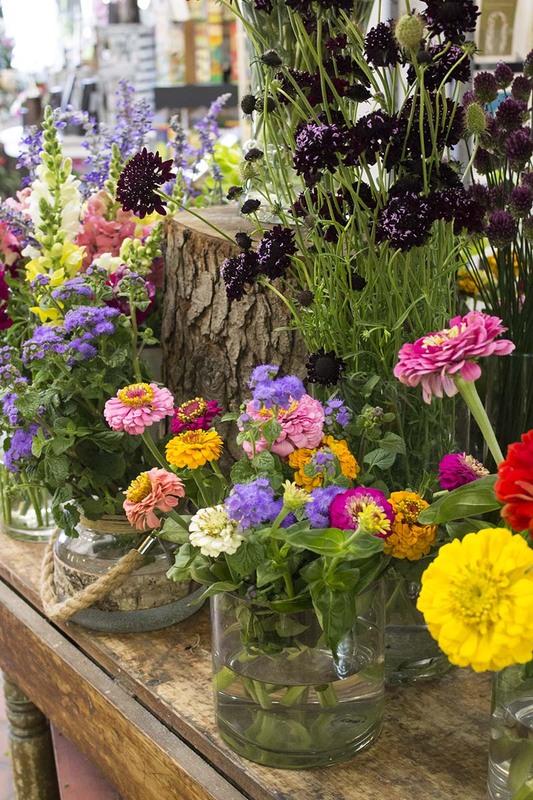 The sunflowers, dahlias, gladiolas, snapdragons, and zinnias grown here are, in our opinion, the best that you can find, and the assorted wildflowers are absolutely charming. Our great-grandfather began working in the floral industry when he and a local farmer worked together to sell dahlias. The farmer sold bulbs to people to plant in their own gardens. While he cultivated bulbs for gardeners, he inevitably had an abundance of blooming dahlias he did not need since he was only focused on the sale of the bulbs. He and our great grandfather came to an agreement so that our great grandfather could sell the cut dahlias. From there on, he slowly expanded and eventually opened up his own flower shop in Detroit. Sunflowers bloom beautifully here, as well, and there’s no better way to cheer up a room than with big and bright Michigan sunflowers. They definitely earn their name! 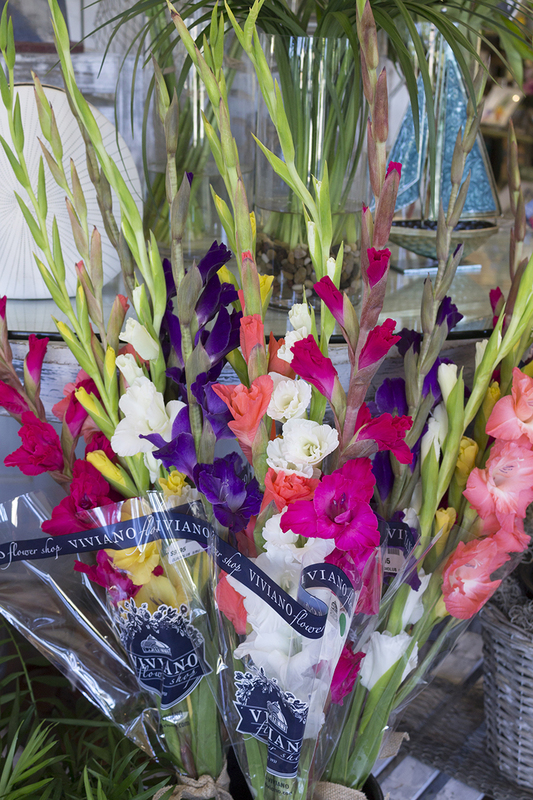 Michigan gladiolus (glads for short) are another favorite flower that we love to use in our designs. 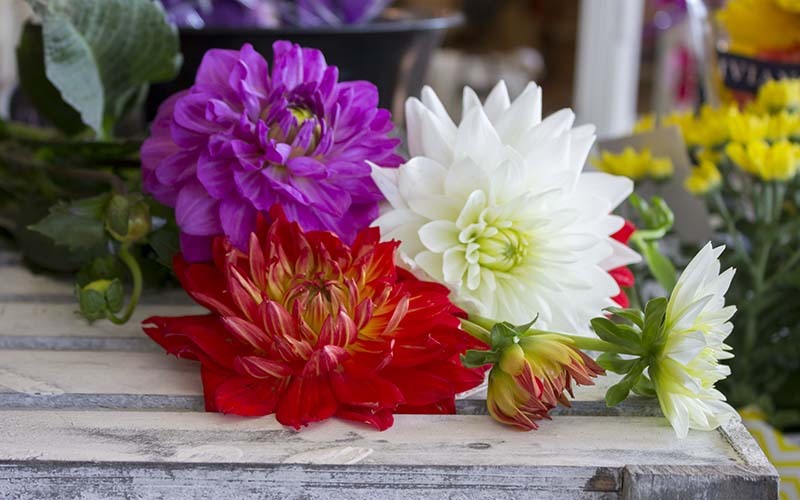 Like dahlias, they come in a huge variety of colors. Our mother loves to put a vase of glads in our front hallway at home. They are tall and showy, last a long time, and are inexpensive. It's a win win all the way! You often see them with the buds closed at the top of the stems, but that is how you want to buy them because those buds will open at home, and you'll get to enjoy new blooms as the days pass. The blooms at the bottom will wilt before the top blooms open, but all you have to do is snap them off and let the new blooms shine! Some of the Michigan flowers we receive are from novelty farms which sell many different types of beautiful and unique flowers. Our friends like to quiz us on our flower facts, but some of the unique flowers we receive this time of year even stump two girls who grew up in the floral industry. It's fun to sneak a peek in the flower cooler to see what beautiful assortment the farmers send us. 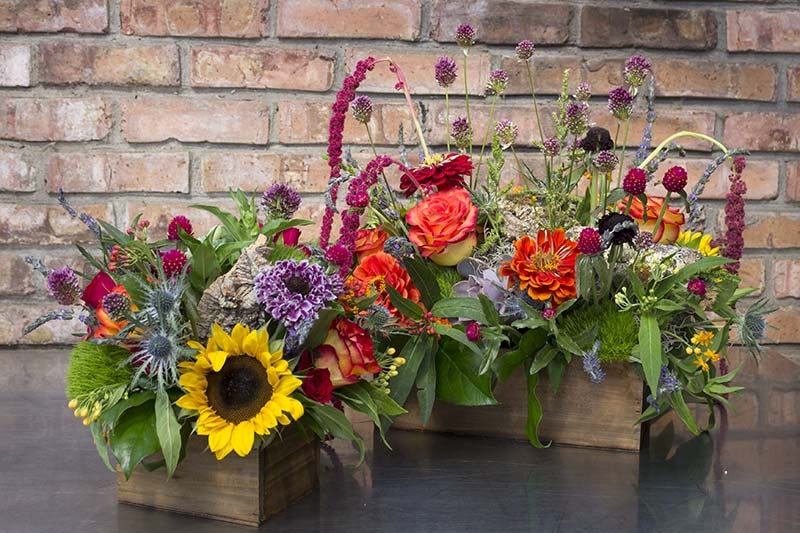 Unique and seasonal varieties of flowers are always exciting here at the flower shop because we are able to experiment with new designs and arrangements. Floral design is an art, and like any kind of art, it is more interesting to use a new medium especially if that medium is a magnificent flower grown in a beloved state. As we reach the peak of the summer season, don’t forget to look around you and enjoy the beautiful flowers blooming right here in Michigan. Hi there! Welcome to our flower shop. We are Elizabeth and Cecilia Viviano, sister duo and the faces behind the blossoming pictures and flowery speech you will find on these pages. As fourth generation family members behind Viviano Flower Shop, we are immersed in everything floral. Flowers are one of the most beautiful parts of creation. Ralph Waldo Emerson put it simply, “the earth laughs in flowers,” and here, we delight in sharing our floral fancies. Thank you for visiting with us!